Renowned artist Thomas Kinkade has created the perfect jigsaw puzzle for Disney fans! 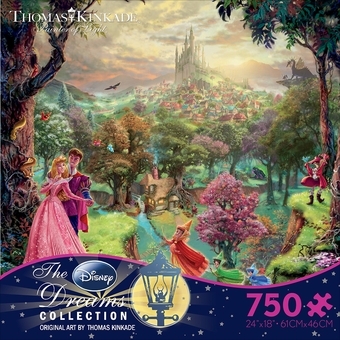 The imagery features Aurora, the Sleeping Beauty, and her prince, Phillip. Other characters from the classic film can be seen in the background, as well as the castle, rising upon the colorful town and lush forest. The puzzle has 750 pieces, and will provide the perfect distraction on a rainy day or quiet evening!